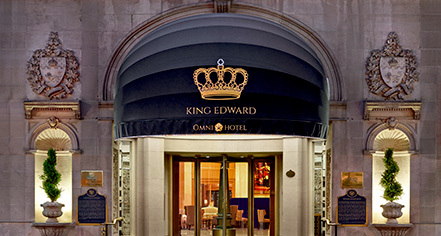 In the heart of Toronto's financial district lies the city's first luxury hotel, The Omni King Edward Hotel. Known as "The King Eddy," the refined establishment has been a significant landmark and choice destination for the social, political, and cultural elite for over a century. This legendary hotel blends its modern amenities while proudly displaying its historic significance and rich heritage. Offering 301 beautifully-appointed accommodations, versatile meeting and event spaces, and unrivaled service, The Omni King Edward ensures an unforgettable stay. The Omni King Edward Hotel, a charter member of Historic Hotels Worldwide since 2013, dates back to 1903. Boasting an art collection that would be worth more than $75 million today, the hotel was an exclusive destination where men enjoyed port and cigars in sweeping parlors while ladies sipped tea in the hotel’s elegant lounges. Early Check-In/Late Check-Out: Available, rates apply. Payment: Hotel does not accept checks. Guests paying in cash must pay their room charges and taxes in full with an additional $150 per day security deposit at the time of check-in. Hotels does not accept debit cards for payment. Visa, MasterCard, Amex, Diners Club, and Discover are accepted. Pet Policy: Service animals allowed: Yes. Pets allowed: Yes. Restrictions: Dogs Only. Maximum weight: 60 lbs. Maximum amount: 2 pets per room (more if preapproved). Fees: $100 (nonrefundable cleaning per stay per room). Other: Extreme or wild animals are not authorized. Service animals for the blind or otherwise disabled are exempt from fee and weight limit. Dogs whose sole function is to provide comfort and companionship do not qualify from this exemption under the ADA guidelines. Transportation: Car service may be arranged through the concierge; rates apply. 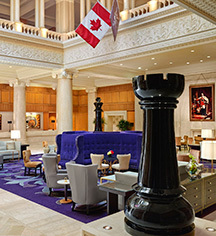 In the heart of Toronto's financial district lies the city's first luxury hotel, The Omni King Edward Hotel. Known as "The King Eddy," the refined establishment has been a significant landmark and choice destination for the social, political, and cultural elite for over a century. Learn more about the History of The Omni King Edward Hotel .